I love this to wall mounted 3 glass shelves to put in my sons room, so I could put his Cable Box nice and neat on shelves instead of on the bottom of his TV. This is a beautiful shelving unit. It is a floating shelf because there are no sides to it. There are Three Large Strengthened Tempered Glass Shelves (Approx 380 x 280mm x 5mm each shelf) which can hold a variety of things. The best feature is you can hide all the cables in the back for a nice and tidy look. Cables running all over makes things look so messy. We have a router, cable box, gaming system on the shelves. So nice and neat even my son says it !! 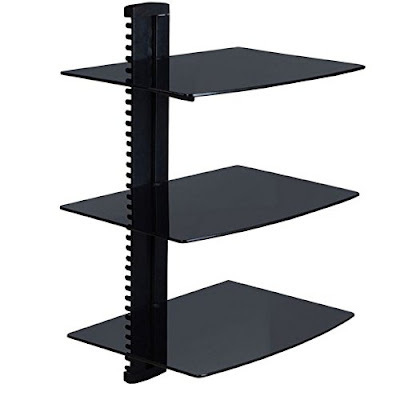 I received this shelving unit complimentary or discounted in exchange for my unbiased review and opinion. All opinions and words are my own.